One length of 6" (5 5/8") Nickel Gap Shiplap Plank, in primed MDF, 3/8" thick. What is shaping up to be the hottest design trend in modern mouldings for 2017. Available in lengths up to 16 feet. One 6" Shiplap V-Grooved Plank, extra wide in primed ready to paint MDF, ⅜" thick by 5 ¾" wide. 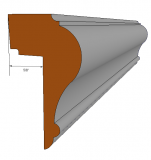 Flexible wainscot shoe trim made from PVC, 3/8" thick x 1 3/8" x 96 long. Well suited for curved staircases. 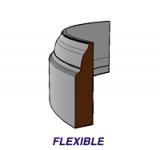 PVC trim is less than half the cost of polyurethane, but if your application required bending around very tight radiuses, we suggest that you use the polyurethane equivalent. A bigger and bolder cap since 2015. Tall Wainscot Cap Trim in primed, finger-joint poplar to fit onto a 5/8" Upper Rail for Elite Wainscot Systems, 8ft long, 2 1/2" x 1 3/8". We offer many different back sets or dados to suit your application. Made from hardwood Poplar for better impact and water resistance than MDF. Reversible Lower Rail with a ⅜" backset for our Elite Beadboard, Wide Plank or Shaker Wainscot Systems, ⅝" X 7" high, 8 feet long. Made from primed, MDF for paint grade applications. 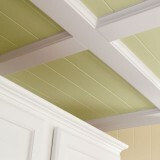 The stiles or planks can rest on top of the ⅜" backset or it can be reversed for Shaker wainscoting. 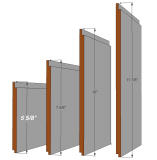 Rail Elite Beadboard or Shaker Wainscot Systems, 3/8" X 7" high, 8ft long. Made from cellular PVC for exterior applications. This serves as both the baseboard and the lower rail. The stiles or planks rest on top as opposed to a standard baseboard that overlaps on top of the stiles. 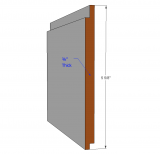 This profile comes with 3/8" dado to work with 3/8" thick planks or the Elite Beadboard System as a base rail or baseboard. Rail Pack, all the rails you need for 8 feet of our Elite Beadboard system with 3/8” thick planks or 3/8' thick sheets in paint grade. This rail pack consists of: 1- 8ft length of: lower rail/baseboard combination; FJ Poplar Cap with 3/8" back set; and a PVC shoe trim for water resistance. The top cap and bottom rail adds 7 3/4" to the height of either the sheets or planks. If you are using 8 foot long planks and cutting them into 3 - 32" stiles for wainscoting, an overall height of 39.5" can be achieved. Elite Wide Plank Kit 40” high containing everything you need for 8 running feet, up to 40" high. The 8ft planks are cut on site to 31 ¾" high, which will produce 18 planks that will sit beside each other to cover the 8 linear feet of wall. The rails and planks are made from primed MDF, where the Cap Trim is made from Finger Joint Poplar and the Shoe Trim is made from PVC, for better impact resistance and moisture resistance. The Cap and Lower Rails add 7 ¾" to the height, with the 31 ¾" planks, an overall height of 39 ½" or slightly over can be achieved. If you prefer something shorter, the planks can easily be cut down on site to accomplish your desired height. Elite Wide Plank Kit 55” high containing everything you need for 8 running feet, up to 55" high. Nine 8ft planks are cut in half on site to 48" high, which will produce 18 planks that will sit beside each other to cover 8 linear feet of wall. The rails and planks are made from primed MDF, where the Cap Trim is made from Finger Joint Poplar and the Shoe Trim is made from PVC, for better impact resistance and moisture resistance. The Cap and Lower Rails add 7 ¾" to the height, with the 48" planks, an overall height of 55" or slightly over can be achieved. If you prefer something shorter, the planks can easily be cut down on site to accomplish your desired height. Elite Wide Plank Kit 8ft high, containing everything you need for 8 running feet, up to 102" high. The rails, planks, and cornice are made from primed MDF, where the Shoe Trim is made from PVC, for better impact resistance and moisture resistance. The Lower Rail adds 6 ¾" to the height, with the 89" planks and the 5 ¼” Georgian Crown, an overall height of 98" can be achieved. If you prefer something shorter, the planks can easily be cut down on site to accomplish your desired height. Elite Wide Plank Kit 9ft high, containing everything you need for 8 running feet, up to 108" high. The rails, planks, and cornice are made from primed MDF, where the Shoe Trim is made from PVC, for better impact resistance and moisture resistance. The Upper Rail and Lower Rail add 10 ½" to the height, with the 96" planks and the 7” Georgian Crown, an overall height of 108" can be achieved. If you prefer something shorter, the planks can easily be cut down on site to accomplish your desired height.